My husband was still riding his bike around calling out with our Adams Family whistle she’s learning and my BHC sings. We hadn’t considered crossing the main road much but he did a few times. I literally had given up for the night and had the cage outside with my kids & Lolli (other bird). My husband called frantically to come. I drove quickly with my kids (didn’t forget to put the other bird away) and he heard her in a yard screaming. We kept calling and I threw my kids over the fence and they spotted her. I tried to run around to get the and my husband found his way in and was tall enough to grab her. She was screaming but when he grabbed her, she purred her happy noises like crazy and then drank and are right away. 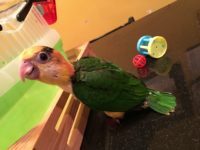 5 month old White Breasted Caique. Head has black spots. Friendly baby. Very loved!! !